Home > Detox Plans > What is Water Fasting? Water fasting is one of the most severe forms of detox diet and certainly a regime to view with some caution. Should you try a water fast? Our guide will help you to make up your mind. As the name suggests a water fast is a detox plan that allows you to ingest only water for a designated period, usually from one or two days to a month. No foods are allowed at all for the duration. Water fasting advocates say following a plan like this from time to time helps to detoxify the body, leading to greater mental clarity, clear skin and better energy levels. Pretty obviously, there will also be weight loss, though this is not a good reason to embark upon a water fast. There are much healthier and beneficial ways to slim down. Water fasting is an extremely restrictive ‘diet’ and as such should not be undertaken lightly. While a short-term plan probably won’t cause harm, it’s important to remember that the body requires certain nutrients that it can’t get from water alone. If you do decide to try a water fast, keep it short and save it for a time when you don’t need to rush around. Can everybody try a water fast? A water fast will make big demands on the healthiest of bodies, so it’s no surprise that it won’t be suitable for some people. Pregnant women, diabetics and the elderly are just a few groups that should avoid this kind of plan. Make sure you do your research to find out if there are any contraindications for you, too. Yes! 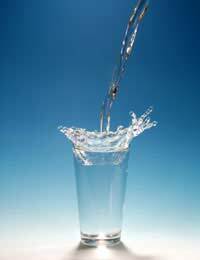 Water fasting will be a shock to your body so it’s very likely you’ll notice that you feel different during the plan. The obvious side effect is hunger, but other unpleasant effects include sickness, headaches, body aches, extreme tiredness and upset stomach. This is also a very impractical detox plan that will make socialising and simply living with others difficult. As with any sort of (non)eating plan, water fasting is difficult to fit into everyday life, particularly if you must still provide meals for your family. Be careful not to drink too much water. Excessive water consumption can lead to back pain caused by over-worked kidneys, and in the worst cases, death. A couple of litres of water a day will be sufficient for most people, but this is definitely an area to research thoroughly prior to beginning your water fast. You should also ease in and out of your fast, as with any severe eating plan. Water fasting has its fans and its detractors, just like every other popular diet. What’s important with any eating or fitness plan is how it will affect you. Find out everything you can before you begin and talk to a medical professional if in doubt. Water fasting is not for the faint hearted!